7 X 12 Mini Metal Lathe. This item is brand new in factory packaging and covered by. 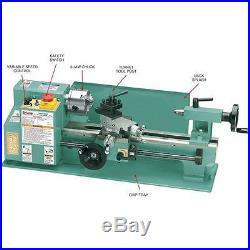 Powered by a 3/4 HP motor, this lathe also features: variable speeds (0-2500 RPM), inch and metric reading dials, turret tool post, chip tray & splash guard. Forward and reverse in all speeds. Chip Tray & Backsplash Guard. Made in an ISO 9001 factory. Bore Size of Included Chuck: 16mm. Spindle nose taper: MT #3. Maximum tool bit size: 5/16. 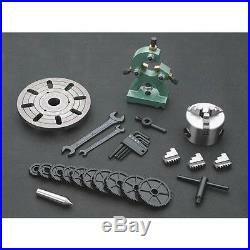 Speed range: Low Range: 0-1100 RPM, High Range: 0-2500 RPM. Range of standard threads: 12-52 TPI. Range of metric threads: 0.4-2.0mm. Motor: 3/4 HP, 110V, single-phase, 3A. Number of thread pitches: 18 inch & 10 metric. 3 Three-Jaw Chuck with External Jaws. Complete Set of Change Gears. We are committed to your satisfaction. Since our inception in 1983, Grizzly Industrial®, Inc. Has grown into one of the largest machinery companies in the United States. Our products can be found in all sizes of shops from the large industrial production users to the smaller cabinet and machine shops. We have the widest product selection under one brand in the world and we sell direct to the user, cutting out the dealer network, and resulting in lower prices to you. We ARE Grizzly Industrial, Inc. We reserve the right to correct errors and omissions in our listings, including specifications, photographs, and pricing. Thank you for your interest. 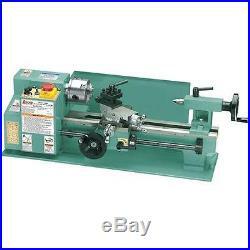 The item "G8688 Grizzly 7 x 12 Mini Metal Lathe" is in sale since Friday, November 18, 2016. This item is in the category "Business & Industrial\CNC, Metalworking & Manufacturing\CNC & Metalworking Supplies\Equipment Specific Tooling\Lathe". The seller is "grizauctions" and is located in Bellingham, Washington.